Welcome Back to Crafty Time 4U! This week had been hectic as well as next week will be! I am on the final weeks of my college classes and I suffer from terrible test anxiety! I have not been paper crafting much for that reason, and I also because it between things I am trying to de-stash my craft room, so it's crazy looking in there and also quite of a hard task! I had bought so many supplies thinking that I would used them and so many stamps and things because I really like them, just to find out that after a certain time I hadn't used the at all! But it has to be done on order to welcome new supplies, stamps, and papers. After all there is a limited amount of time to craft in this life! Here is my take on the sketch challenge by Newton's Nook. As you might had noted by now, I had a particular way to take on to sketches, but I still hope you'll like it and enjoy it! I love this stamp set! I have several Newton's Nook stamp because I love kittens and all sort of animal stamps, but these roses' stamp set is so adorable and a must have! Oh, Heidi, you and I both have the same issues with crafting supplies. I had already de-stash most of my supplies in January, but I feel like there are still so many supplies in my room. Supplies that I bought years and years ago that I kept telling myself I might use it. Ha! It's been four months and yet, I haven't use it! I think I just need to be realistic and find those old supplies a new home. Very gorgeous card, by the way! It's so overwhelming Ka! I always thing I get to them but it never happens! Seen new releases helps me realized that better things are coming and it is more easier to let things go! Absolutely gorgeous card! Love those amazing flowers and your take on the sketch. Good luck with your finals, I know you will be an amazing job! Thanks so much for your good wishes Tanya I hope everything turns out good, spring semesters always seem harder! Thanks Shannon! First time I used that thread trend! So glad you liked it! This is beautiful! I love how you added in the gold with the embossing and the little gold banner! Good luck with your final exams - I know that can be stressful! 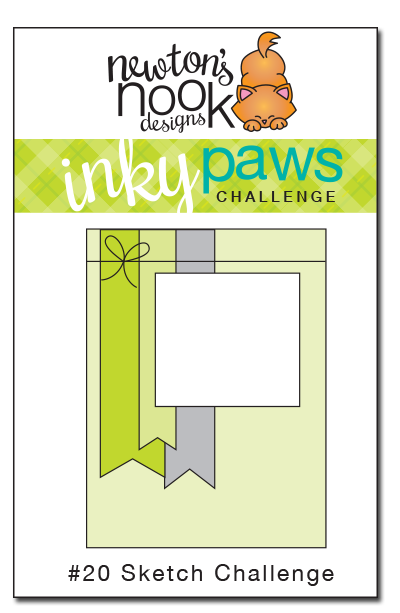 Thanks for taking time out to play along with our inky paws Challenge! Thanks so much Jennifer, you know I'm not a flower girl, my thing are animals, but I love this stamp set! Love the flower arrangement you made! Thanks so much Lucinde, so glad you stopped by and liked it!